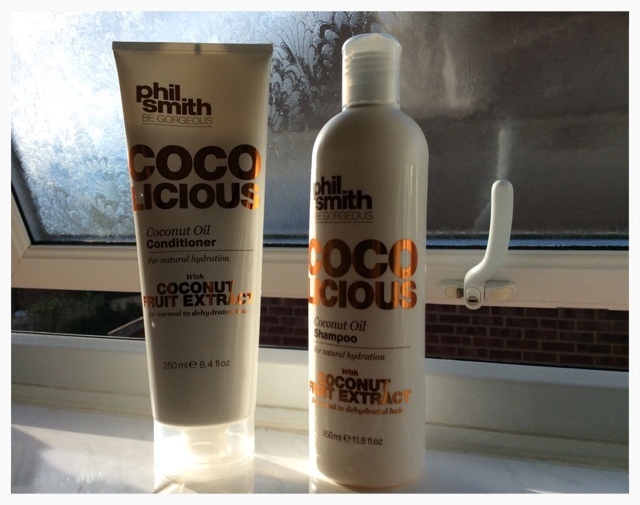 If you've read my previous posts you'll know that I'm a mega fan of Phil Smith hair products so I was quite excited when I saw this shampoo and conditioner the other week. It's got to be said that I do think that this shampoo and conditioner truly are 'Cocolicious' (love that name), it really ticked a lot of boxes for me. For a start it smells like coconut, which along with anything that smells like Vanilla is my absolute favourite. Secondly, neither the shampoo or the conditioner are too thick, by that I mean they are easily rinsed out. I find that sometimes products that are for dry or stressed hair take ages to rinse and I'm never sure I've got it all out and I hate feeling like there's a lot of residue. Not so with this product. Thirdly, I first used this when I was staying at my Mum and Dad's and they live in a hard water area so I always find my hair reacts differently when I wash it at their house. I was really pleased to find my hair so soft once I'd dried it, in fact so happy that I left it at their house to use next time I visit (I bought some more for home). Speaking of where you can buy this, it seems that it's exclusively in Sainsburys supermarket in the UK, the bigger stores to the widest range of his products, that's where I first discovered Phil's products. There's a lot more information about the shampoos and other products on the website www.philsmithhair.com. If you'd like to read my other Phil Smith product posts, please see links below. This is a sea salt spray product for 'beach hair'. This is a curl cream for soft curls. So here I am typing this from very sunny, sometimes rainy Florida where we are on holiday as a family, taking advantage of half term and whizzing off for some sun. I've been coming here for a long time now and I love it, Disney isn't everybody's cup of tea but we've had a great time and if I could have dressed up as Cinderella and taken part in the parade, I would have! As well as theme parks I've also had time to do a bit of shopping. I love the stores here because they sell stuff that's completely different to the UK so it's always interesting to compare products and prices and I love finding new discoveries and recommending them to my family and friends, the choice of health and beauty products in the US supermarkets is amazing and I'm going there tomorrow to see what I can find (that probably makes me a bit sad, oh well). We did go to the mall outlet the other day where I ditched the hubs and kids (sent them to sports shops) and went off by myself to do a little cosmetic shopping. It was quite nice not to have someone telling me they were hot, needed a wee or a drink or the whole "he hit me" scenario which you get with young children and I was able to peruse to my hearts content without being interrupted. 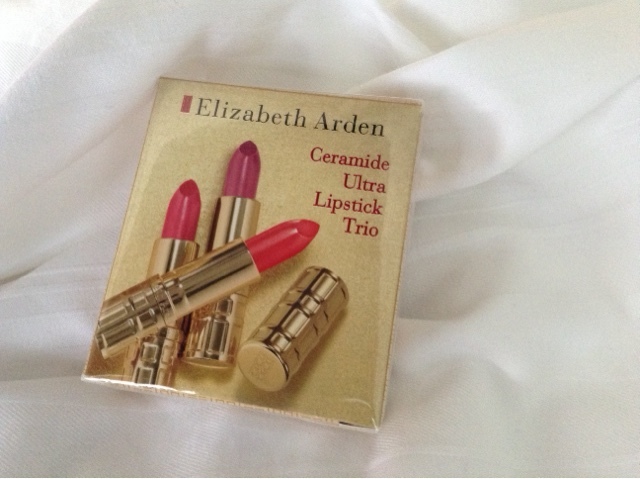 I found some excellent bargains in the Elizabeth Arden shop where there were several buy one get one free deals and in the Clarins shop also, where I could have done some real damage but managed to restrain myself. As I rarely buy Clarins in the UK it was a bit of a treat and the prices were really good as most of it was last years' range or excess. All authentic products though so definitely a bargain. 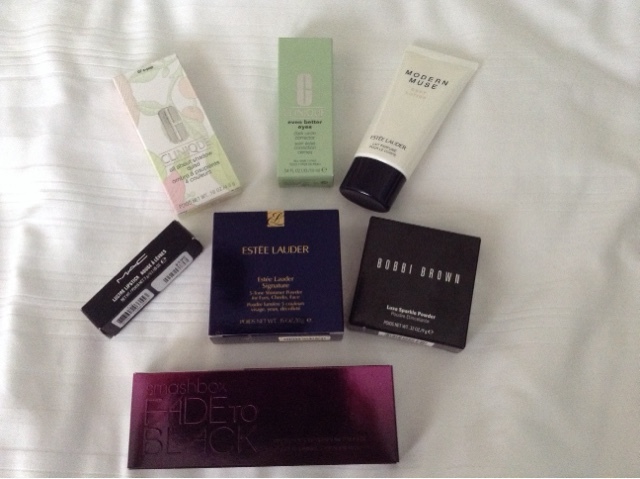 I also found a fantastic cosmetic shop which sold brands like Bobbi Brown, MAC, Clinique, Estee Lauder, Origins, Smashbox and others. I was there for AGES! I think they thought I would never leave. I did buy a few bits from there but again I was on a bit of a budget so I couldn't go mad so I had to choose the products that I thought I needed or would be interesting to try rather than just sling stuff in my basket. I'll be reviewing a lot of these when I get home, I've popped some pics of my little haul below so you can see what I got. We are off to the EPCOT centre this afternoon no doubt to stand for ages in queues for signatures of characters, but that's what you do when you've got a five year old obsessed with Mickey Mouse! I assessed my nail polish collection the other day and realised that most of them are pink, light pink, dark pink, red-pink and cerise but definitely all pink. I love pink nails for every day because they are colourful but not too in your face, and the chips are easier to disguise! 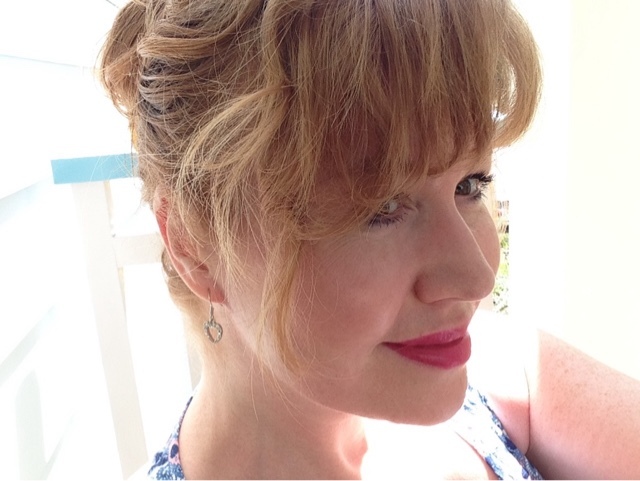 I loved Rita Ora's Rimmel "Sweet Retreat" so much that I wore it for months! Recently though, I've been wearing Sally Hansen products, and I'm just a little bit in love with her Miracle Gel Polish. There are 48 colours to choose from (although it won't surprise you to know that I've just used pink so far). Here's the link to the Boots website where you can buy them. The overall finish is that of a gel manicure and to be honest I was suspicious because how can you really get that without all the stuff they use in the salons? The blurb on the Boots website says "The only true 2-step Gel Manicure with no UV light needed"and it does seem to be a bit too good to be true but it has to be said that you do get a lovely finish. What's more it doesn't take a lot of scrubbing with remover to get it off, a couple of wipes per nail and you're done. I do one coat which lasts several days and then go over the top which makes it last another two or three so I'd say you could easily get a week out of this with it still looking fresh. The colour in the photo below is "Shock Wave" and though there isn't a photo of it actually on my nails the colour in the bottle is a true reflection of what you'd get on your nails. Well worth £9.99 I think and I'll definitely be buying more. Happy first day of February everyone! It's been a while since I've written a Lipstick Love post so today I thought I'd show you this one from Pixi by Petra. It should be noted that I love this one so much that I am now on my second one and I only discovered it about a year ago! I first discovered Pixi on beautybay.com and became a big fan of their Flawless Primer but now I'm even happier because Marks & Spencer now stock it as part of their beauty department which means that I can buy it online and in store now. I was amazed the other week when I went in, Marks & Spencer have had a total overhaul of their beauty section and now there are lots of well known brands both high end and the old favourites, I'm actually going to write a post on it soon so I'll stop talking about that now. Anyway, getting back to Lipstick Love, today's is a Pixi by Petra Shea Butter lip balm. I find balm's can be a bit wishy washy in colour, not so with this one, it's a lovely deep pink colour which you can build up into a very strong pink should you so wish. 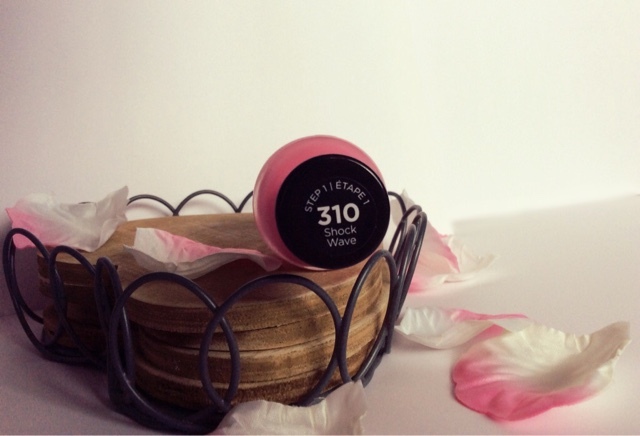 The balm part is really good, it isn't sticky or overly glossy so it doesn't slide off your lips, in fact it doesn't transfer easily, I find it does last quite a long time. There are several colours in the range but this is the one that suited me most because it was a stronger colour, the one pictured is called Ripe Raspberry. Since I bought this I've also purchased a Pixi concealer quad which I have used far more than I expected to and will definitely re-purchase, it's a stable part of my concealer collection now. Pixi can be purchased on their own website www.pixibeauty.co.uk or on www.beautybay.com and in Marks & Spencer's stores too. I'll definitely be adding more of their products to my ever growing cosmetic and skincare collection in the future. I would love to know your Pixi favourites if you've got any too. 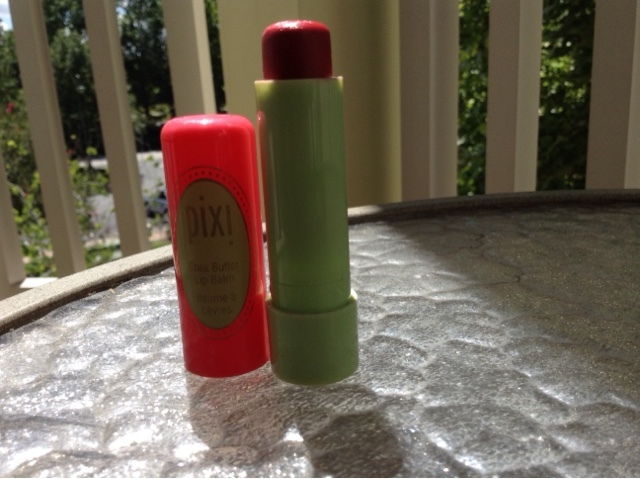 Pixi by Petra Lip Balm ... on me!